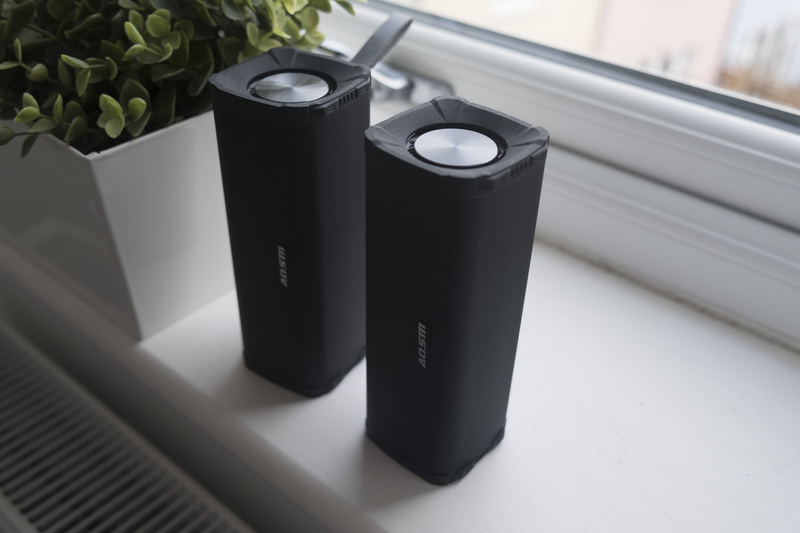 Bluetooth speakers are a dime a dozen these days, but these ones can something special: a pair can connect together to give you proper stereo sound. 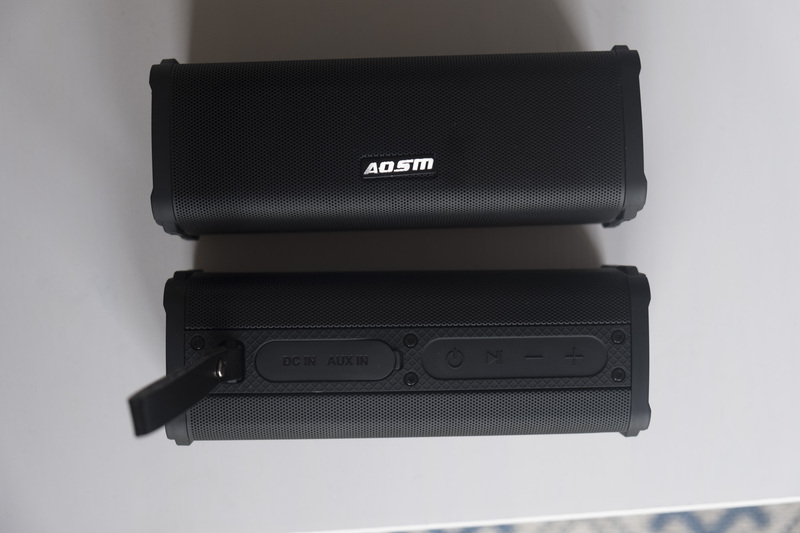 We’ve been sent two to test out; here’s our review of the AOSM68! The AOSM’s special abilities haven’t affected its outside appearance, which is quite pedestrian. The bulk of the speaker is covered by a thin wire mesh, with the AOSM wordmark on the face of the speaker. The AOSM68 has a rugged design, with reinforced corners that should allow it to handle a little rough and tumble. 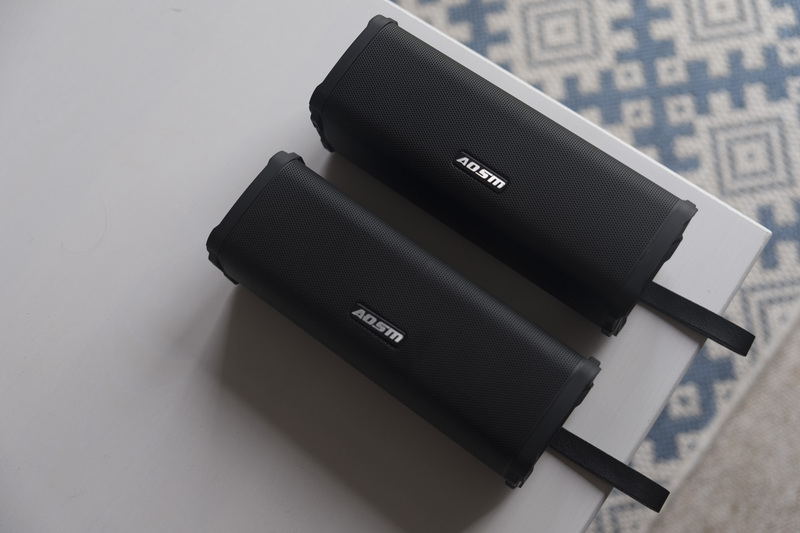 The speaker has boasts dust and water resistance, with the IPX5 rating signifying complete protection from environmental dust and limited resistance to water splashes. The back of the speaker holds most of its features. On the left, we have a water-resistant panel that conceals the Micro USB and 3.5mm headphone sports, while the right side has four buttons: power, play/pause, volume down and volume up. There’s also a leatherette carry strap. We used the AOSM68 for a one week period, using it both in its ‘true wireless stereo’ mode and as a single speaker paired to a Samsung Galaxy Note 8 smartphone. Here’s what we think. The first challenge of any Bluetooth speaker is pairing. Sadly there’s no NFC here to speed up the process, but we didn’t face any issues. Turn the speakers on and they’ll start pairing automatically. 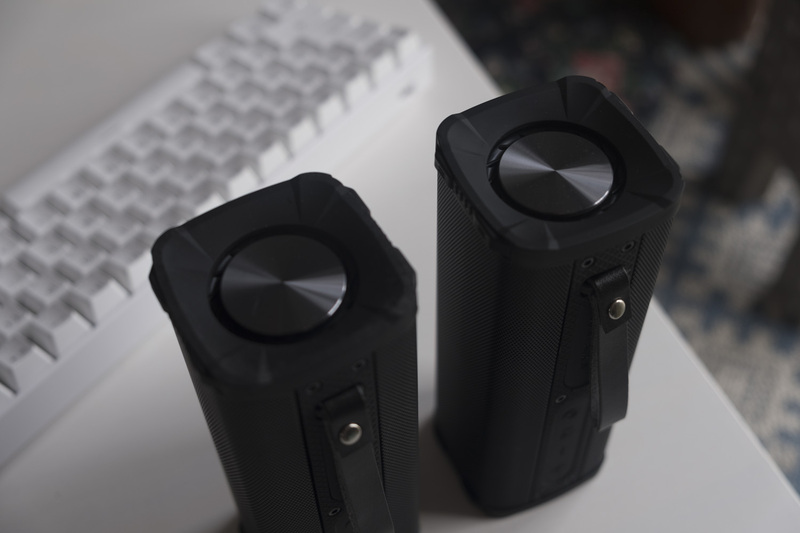 Once both speakers are ready, you can press the power button on both simultaneously to engage the stereo mode. From here, everything works as you’d expect — each speaker takes a channel, giving you stereo sound at the expense of a little added delay on the broadcast. This is because the first speaker needs to send the audio stream to the second, then wait a little bit before playing its part so that both are in sync. That makes this less suitable for games or video; music is the best use case. Another element of usability are controls. We have four slightly spongey buttons which nonetheless do their job with aplomb. It’s worth noting that the plus and minus buttons will skip tracks by default; you need to hold them down to raise or lower the volume. Happily, doing so will raise the volume on both speakers simultaneously, preventing any imbalance issues. In terms of durability, the AOSM68 are impressive. The reinforced corners allow the speakers to shrug off rough use, while the water and dust resistance should allow for some non-lethal encounters with environmental hazards. While these aren’t must-have features for most people, they can at least put your mind at ease. The final element I’ll discuss in terms of usability is how you physically position the speakers. Normally I’d expect that you could lie the speakers horizontally or vertically, but on the AOSM68 vertical is the only way to go — this is because the back side of the speakers has the leatherette carry strap jutting out of it, preventing the speakers from lying flat. This strap can’t be removed without cutting it, so a vertical placement is the only one that makes sense. So: when it comes to sound quality, are two speakers better than one? Yes. Stereo was developed for a reason — having two speakers gives a much better sense of presence, and allows music makers to be more creative in their recordings. However, does stereo justify purchasing — and then carrying around — two Bluetooth speakers? Maybe not. You only get a $5 discount for buying two speakers at once, so you’re throwing in $65 in total to get the full set. The sound quality certainly rivals that of single speakers at this price point, but you have to deal with more complexity: two speakers to carry, two speakers to charge, two speakers to keep in good nick. Bluetooth speakers are great because they are simple and portable, and you lose something when you use two speakers instead of one. Joined together or as a single unit, the AOSM68 boasts balanced sound with reasonable mid and high-end performance, and even manages to provide some bass at higher volumes. However, these higher volumes can make the high notes a little too ear-splitting, so there’s a balance to find there. The AOSM68 speakers are rated at eight hours of battery life, and that was borne out in our testing. As mentioned above, you do have to charge two speakers instead of just one when their electrical reserves run dry, so prepare accordingly with a multi-port USB charger. Ultimately, I’m not convinced that stereo Bluetooth speakers are a must-have feature. However, in certain situations I can certainly see the appeal — for example, if you like to listen to music throughout your home, then having two units to carry around isn’t that much more difficult than one, and you certainly get something from proper stereo separation. For use out and about, I think the case is much less clear, and I’d generally suggest sticking with a single unit. So: is a single AOSM68 worth getting? Deprived of its standout feature, the AOSM68 still makes a good case for itself. The durable if anonymous design, easy usability and good sound reproduction make this a strong speaker. 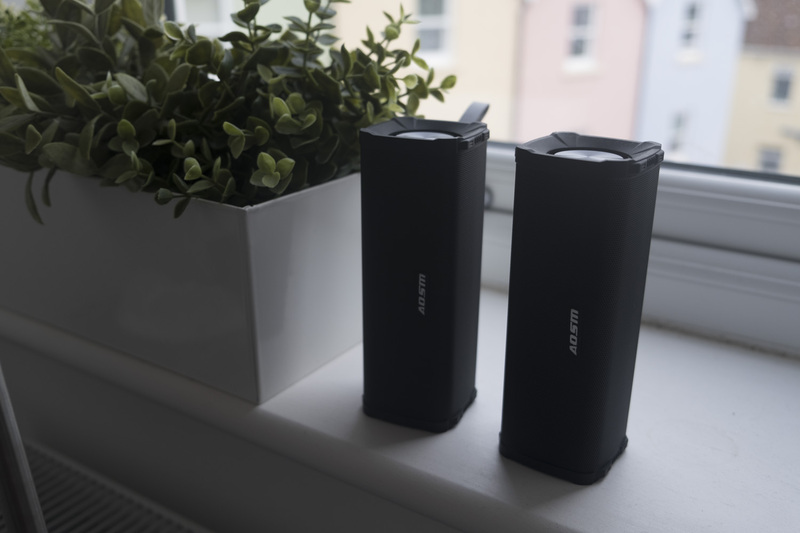 However, the Bluetooth speaker market is incredibly competitive, and sales can rapidly upend the accepted hierarchy on Amazon’s popularity charts. Ultimately, a single AOSM68 unit doesn’t do enough to make it a must-buy. THIS IS NOT STEREO IT IS JUST DUEL SPEAKERS for true stereo listen to your dads stereo amplifier.